Villains hoping to flee the merciless will of the Prince of Shangri La have sought refuge in the ancient city of Cairo. However, the Prince, not being a man easily thwarted, has decided to extend his reach across the desert sands, promising ample rewards to those Detectives brave enough to cross the Pirates' blockade and track down those who had thought themselves safe to carry on their evil deeds unhindered. But beware! Tread softly. The people of Cairo are a guarded and stoic folk, burdened by years of isolation. Their secrets will not be so easily obtained. Be prepared to get sand in more than your shoes before your time is done. 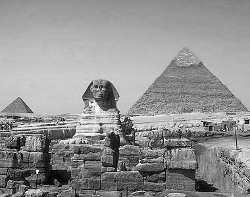 Read more about the lead up to the opening of Cairo to Villain Hunts below. Agents of the Prince of Shangri-La professed today that they were baffled by Mordred "the Snake" Malatesta's disappearance. Last seen with co-conspirator Patricia Green, his whereabouts remain a mystery, as she had no knowledge of his travel plans. The Prince's Ambassador has confirmed today that Mordred '"the Snake" Malatesta remains at large. Last seen in Shanghai, detectives continue to scour the City for clues. 'We're chasing our tails, going back to old haunts, but we're running out of places to search." he stated ponderously. Palace Authorities confirmed this morning there are rumors that Mordred '"the Snake" Malatesta is dead. A Palace Spokesperson made the following statement: "Reliable sources inform us that Mordred "the Snake" Malatesta has fallen overboard, and met his fate, while traveling aboard the Sleuthetania." Pirates Tied to Missing Villain? Rumors continue to circulate about the reported death of Mordred "the Snake" Malatesta's. An anonymous source aboard the steamship Sleuthetania claims to have seen the Villain signalling a mysterious passing ship in the night. "Fall! ", the witness exclaimed. "That man stood on the railings and executed one of the most perfect swan dives I've ever seen." The Prince of Shangri-La has expressed concern over the failure of a leading detective to capture Mordred "the Snake" Malatesta. "There are a limited number of places he could have gone," fumed the Prince in a rare show of temper. "I cannot understand what the problem is. Never before has a detective so badly failed me!" A frustrated Prince of Shangri La has sworn to find new detectives to serve him, after a spate of failures and setbacks. "Nobody just disappears without a trace," sputtered the Prince. "They're out there, and they will be caught!" All detectives of sharp wit and sturdy constitution, able to travel the world freely and avoid the perils of the sea, are invited to assist the Prince with his mission to end the rash of disappearing evil-doers. Anyone interested in the thrill of the chase and ample rewards should attend the Prince in his Chambers on May 1, 2010.